Austin Peay then continues its quick homestand the next night when it hosts Division II Christian Brothers in a day-night doubleheader with the APSU volleyball team. Two nights later, Austin Peay hosts Division II Trevecca to conclude the homestand. After a three-day break Austin Peay begins a five-game road trip with three games in five days. Midlick will take his team first to Miami (Ohio), November 19th, followed by games at Wright State (November 21st) and at Ball State (November 23rd). Another three-day break follows before Austin Peay heads to Nashville to play in the Vanderbilt Thanksgiving Invitational, November 27th-28th, which includes host Vanderbilt, Ohio and Indiana. A busy November concludes with a visit from Middle Tennessee, November 30th, the final home game during the schedule’s nonconference portion. Austin Peay will have a quieter schedule awaiting it when the calendar turns to December with just four games – all on the road – in the month. APSU will travel to Western Kentucky, December 5th, and one week later trek to Kennesaw State, December 12th. Austin Peay then heads west to meet Arkansas State, December 16th. The nonconference schedule comes to an end with a December 21st contest at East Tennessee. It will be the first meeting between the two in-state foes since the 1997-98 season. A 16-game Ohio Valley Conference schedule awaits the start of the New Year. Austin Peay opens league play with a three-game homestand – that opening with a Jan. 2 contest against Eastern Kentucky. Jacksonville State visits January 7th followed two days later by Tennessee Tech. The following week Austin Peay travels to Belmont, Tennessee State and Morehead State. Eastern Illinois visits the Dunn Center, January 23rd, followed by a January 27th contest against SIU Edwardsville. 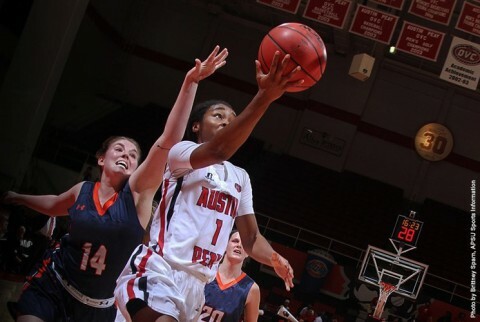 Trips to Southeast Missouri, UT Martin, Murray State and Eastern Illinois loom as Austin Peay will have to traverse a four-game road trip to start the second half of conference play. Defending regular-season champion UT Martin enters the Dunn Center for a February 13th contest to end the road trip. Austin Peay heads back to the road for a contest at SIU Edwardsville before returning home to end the regular-season slate with a two-game home stand. Consecutive Saturday contests wrap up the schedule with Murray State, February 20th, followed by Southeast Missouri, February 27th. Dates and times for Austin Peay’s road contests are subject to change. Fans should visit www.LetsGoPeay.com – the official website of Austin Peay Athletics – for the most up-to-date schedule and team information.